Happy New Year! Did you enjoy a few bottles of bubbly over the festive season? If so, I hope you had real corks and didn’t fall prey to the pesky plastic corks! Apparently there are 13 billion natural cork wine closures sold into the world market each year. At present, the majority of them end up in landfills which is a waste of a resource because cork is biodegradable, renewable, energy efficient, sustainable, and 100% natural. If you’ve got a few corks lying around here are 11 ways to reuse or recycle them. Please add your ideas to the comments below! You can chop corks up finely and add them to your compost heap – the perfect example of turning trash into treasure. Laithwaites, The UK’s largest mail order and online wine merchant has installed cork recycling bins in its 10 UK stores. The corks are either granulated and used on the company’s vineyard in Reading, or donated to local schools to make corkboards for charity. Find your local Laithwaites wine shop. Give your corks a new lease of life as a clock. Send your corks to Clorks where they’ll be created into works of art for time to come. Corks can make cute place card holders at your next dinner party. Cut the corks lengthways, but not all the way through and slot a card into the gap you’ve created. Alternatively glue 2 corks together, side by side, by placing a dab of glue near the bottom. This leaves a groove at the top to insert the place card. The old favourite – the options available to you for making your own cork board are only limited by your imagination. How’s this idea for recycled wrapping; imagine one of these wine cork ornaments adorning a gift for a wine lover. Check local schools, artists or community projects to see if they want corks for any current projects. Apparently the Eden Centre once had huge figurines of animals and humans made entirely from cork! 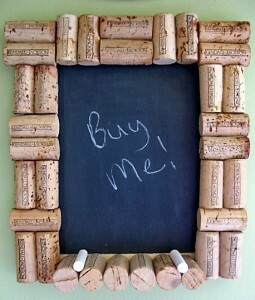 If you live in the US, send your used corks to Yemm and Hart who will upcycle them into snazzy wine cork tiles. Alternatively contact Recork who are working with companies to make old corks into footwear. Take inspiration from this beautiful chalk board and you’ll never mislay your shopping list again. In time for next year, get saving and make yourself a simple cork Christmas wreath. Erm, make a chair out of them. Well I hope you haven’t been drining *that* much! I have to admit to using ours to start the wood stove. Not the best use probably, but better than buying fire lighters and binning the corks! I don’t think I’d ever have the patience to chop them small enough to compost them- I have lots sitting whole in the compost bin and garden where we’ve composted them without chopping. If I lived closer to a Laithwaites I’d certainly return them to for them to compost. What a lot of good ideas, particularly liked the chalk board, and you also have a place for your chalks. Oh, and hurrah for seeing some a mass of creative re-use ideas on here, Something i am very passionate about. Great Ideas!! I am currently creating a Radiant Arch Design to place above the Window in our Hot Tub House (great place to enjoy wine & precious corks). I never thought about “feeding” the slightly damaged corks to ‘Fertile Myrtle’ our Compost Heap! We love to Recycle Everything! Apparently there are good options to recycle cork too. Our (very large) local liquor store chain collects corks and donates $1 for each one to charity. The corks collected get recycled. I’m guessing they either make a little money from the recycling. Hopefully more retailers will start looking into that option. I made Christmas decorations from my corks and gave them away. I have a friend who has the roof of her house filled with the corks. I guess if you can re-use them, that’s my excuse to open up another bottle of wine. Love the chair too. I just put ours in the compost whole. Isn’t it about time we pestered the wine industry to start labelling the bottles with the type of cork used? For ages we avoided new world wines which use plastic corks as they don’t have a cork industry but now even quality French wine producers are starting to use plastic too and you can’t tell until you open the bottle! I’ve used particularly decorative corks as beads on my jewelry by simply drilling a hole throught the center. A wine loving friend of mine has a display of wine corks in a market basket on a sideboard that stores his wine glasses. It’s so pretty! Wow – what a great response to recycling corks! Corks are actually “my precious.” I love the feel and texture o them for smart craft. Although I am saving corks for a cork board, I am now rather keen to have a go at decorations. I hadn’t seen that idea previously so thanks for that, Mrs Green. And….my new site is up so please do go and have a nosey around and let me know your thoughts. If we’re talking Zero Waste, I think corks are the daftest idea for topping ott bottles. It was invented, I suppose, before our wasteful society thought of plastic and, worse, plastic-coated tinfoil, Corks have to be kept wet to prevent shrinakge and therefore damage to wine, so the bottles have to be kept lying down. In cellars and warehouses, I suppose, that is neither here nore there; same area of space any way up. But once a cork is used to close a bottle (and I speak as a winemaker so i know what I’m talking about) then it becomes the most difficult means of opening that bottle. I am stuck with the necessity of a key for opening my front door, a separate one for the back door, one for the garden shed and one for the coal shed, one for my car and another for the boot, not to mention a key for the petrol tank. Is it any wonder I’m driven to drink? But I need a special opener for a beer can because I’ve broken all my fingernails on the other keys. One for the pop bottle to keep the kids quiet and yet another one to untwist the lemonade to dilute the whisky I have to drink because I can’t find the ****** corkscrew! I have re-cycled corks for years, drill a hole half way through lengthways and push firmly on the top of garden canes, a great way to protect you when bending over the flower borders. To make them decorative you can always paint them first. @Hazel: I think using them as firelighters is a fine idea – the ones you buy are so toxic. @Sooz: No problem sooz; I rather fancy a cork chair too! @RecycleBill: Thanks Bill, good to know for our US friends. @Calisara: the garland sounds neat; I would love to have the patience to make one. Perhaps we should all club together for a chair! @Alyson: Do they break up Alyson? @Cate B: Absolutely right Cate – it would be good to have it labelled clearly so there are no nasties when you get home. @Lisa D: Loving your ideas, Lisa; never thought of using them as drainage material – thank you! @CarSue: thanks Sue, I’ll never look at a cork in the same way! @Condo Blues: Oh nice! Modern art and I guess they are all so different too. I like that idea. when a knob on a lid of a pot breaks, simple screw a cork onto the remaining screw on the outside of the lid of the pot. A champaigne bottle cork is ideal. Just cut to size before screwing onto the screw. It will not overheat and is easily replaceable if it wears off. I have done this several times already. excellent ideas. never thought of such clever ways to use the corks. You can also make door curtains to keep the flies out, by threading the corks onto a gutline to the length desired, vertically or horizontally. @giusi: Hi giusi, I LOVE your suggestion for the saucepan handle. Mr Green repaired one of mine the other week, but it’s nowhere near as pretty as your suggestion! The one for stamping is cute too, but not sure I have the patience for such intricate work! I’ve printed with these too. They make a good alternative to the potato print. They last longer and are a good size for little hands. For one year’s Christmas card I printed the green holly leaves with a potato print and small son printed the red berries. The clock: great! Chrismas wreath – original. Notic board – good. We´ll try it! @Petr CZ: Welcome Petr and I’m glad you found some things in the post you feel you could try yourself! Corks are ideal for putting on the end of garden canes, that you use to prop up plants. They are a perfect remedy to safeguard against canes pocking your eye out, as you bend over the plant. Just cut a hole in the end of the cork and push the slit into the cane. – a safe place too for the sharp ends of fish hooks, corkscrews and needles in a box in transit or in a drawer. First off, please make sure to buy wine with natural cork (as opposed to plastic) corks. The decrease in demand for cork threatens the economic survival of cork farmers in Spain and elsewhere (and thus the cork oak forests which are important habitats for a multitude of animals). Please note that the trees are not killed in order to harvest the cork — many of the trees are hundreds of years old. Secondly, a tip for anyone living in Germany: NaBu collects corks and turns them into insulating material. The proceeds go to a project protecting cranes in both Spain and Germany. Google “nabu-Korkkampagne” or call your local NaBu office for collection points. I love the chair! Has anyone a building instruction for one, or a stool; in partucular, how to fix them together in a sturdy, durable way- without having to stick corks on a wooden chair- that would be cheating. @michael.ka: Hello Michael, I like the idea of your mobiles; I bet they look great. I don’t have instructions for the chair I’m afraid. Why not contact the artist and see if she can help? @jasin: Welcome Jasin – – good to see you here; we hope you enjoyed the show! The reason for plastic corks is that they greatly reduce the probability of the wine being “corked” (spoiled due to bacteria that can grow on corks). 1 in 10 bottles of wine with real corks are “corked”. That said, I’m loving these ideas! What about dolls made from corks strung on wire in a mannequin shape? I’m managing to mostly avoid them by buying organic wine from a few selected vineyards. On the occasions I do end up with plastic corks, I cut them in half and use them as spacers between outer and inner flower pots so my plants don’t get “wet feet”. @Susan: Love the flower pot ideas Susan – thank you! It’s in Spanish but she uses lots of pictures so that anyone can use the ideas even though you don’t understand the text. @Ana: These are lovely ideas; I LOVE the little men / gnomes. Thanks for taking the time to share Ana!